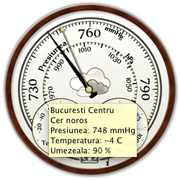 Displays the measured values of air pressure, temperature and humidity as well as the general weather outlook for more than 45 cities in Romania. 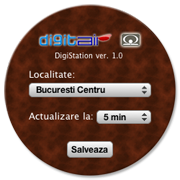 DigiStation uses the information from the National Meteorological Administration. 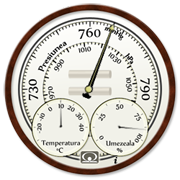 It works exactly as a wall barometer; a click in the center will bring the marker over the indicator, and its position shall be fixed enabling the users to follow the pressure tendency. If you're using Safari, click the download link. When the widget download is complete, Show Dashboard, click the Plus sign to display the Widget Bar and click the widget's icon in the Widget Bar to open it. After the installation, click the widget properties indicator ('i') to access the configuration panel. Choose the city of interest from the drop-down list as well as the refresh interval. Finally, click the 'Salveaza' (Save) button. Running platforms: Mac OS X 10.4 Tiger or newer. Snow Leopard compatible!